Dàdù Plateau 大肚台地 (also known as Dadu Mountain 大肚山) is a geographic feature of great strategic importance to the defense of central Taiwan. It overlooks the west coastal plain and occupies high ground on the far edge of the Taichung Basin 台中盆地, home to the majority of the population of Taichung 台中, the third most populous metropolitan area in the nation. The entire length of the plateau is peppered with military facilities from the massive Ching Chuan Kang Air Base 空軍清泉崗基地 in the north to Chénggōng Ridge 成功嶺 down south. 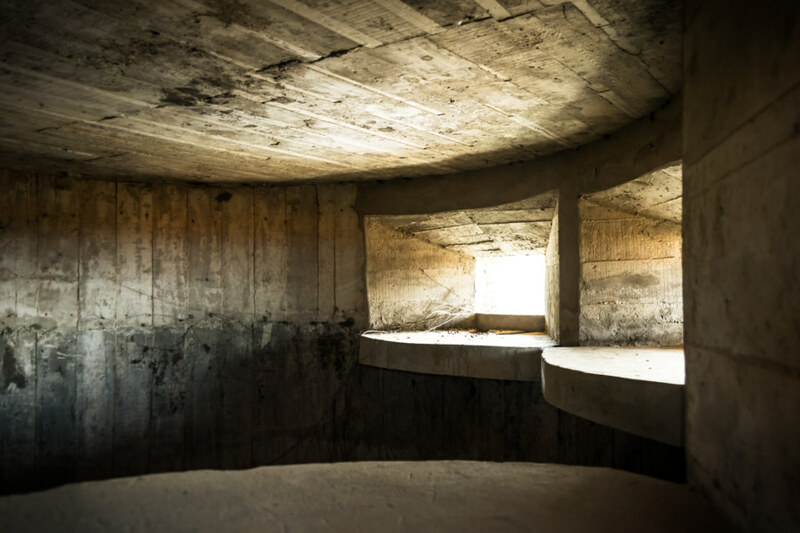 In between one will find a number of abandoned or disused bunkers, gun towers, and blockhouses. 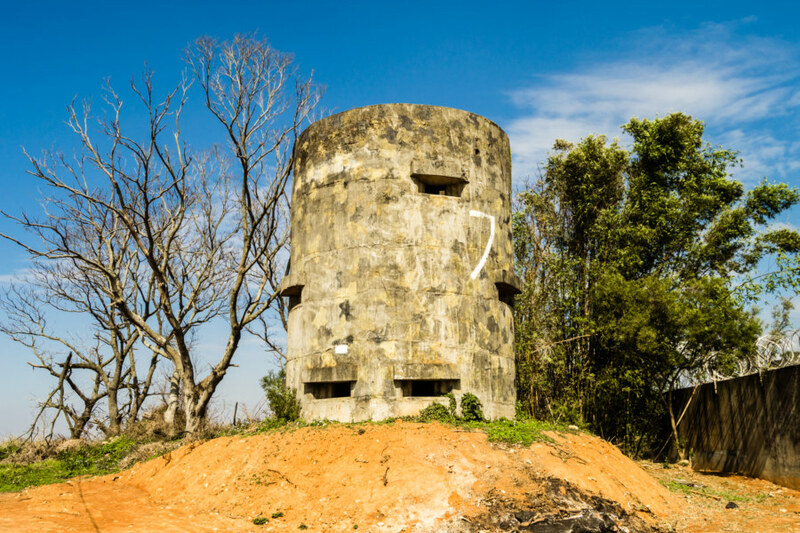 This post focuses on seven anti-airborne fortifications located in the central part of the plateau starting with the #7 Anti-Airborne Fort 七號反空降堡, my introduction to this cluster of ruins. 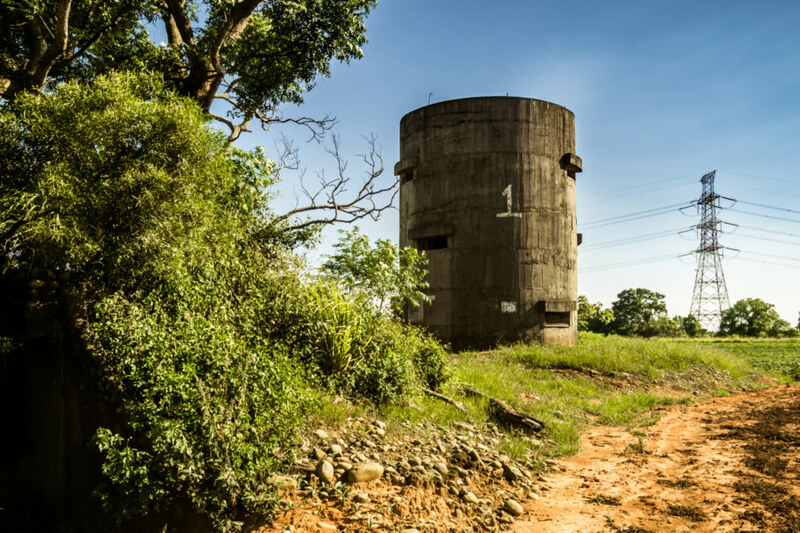 An abandoned fortification on the edge of the Dadu Plateau in Taichung. One of at least seven fortifications scattered throughout this part of the Dadu Plateau. 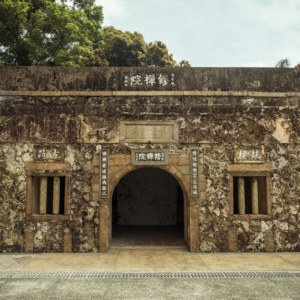 Located not far from county road 中75 in the southwestern corner of Dàyǎ 大雅, the #7 Anti-Airborne Fort is readily accessible and fairly safe to explore, though a flashlight is mandatory and you’d do well to pack gloves (especially for the rusty ladders) and insect repellant. 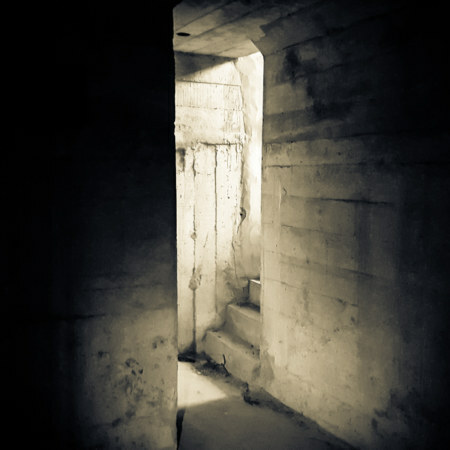 As with most of the other fortifications of this kind there are two camouflaged entrances located nearby—a safety precaution in the event of heavy bombardment. 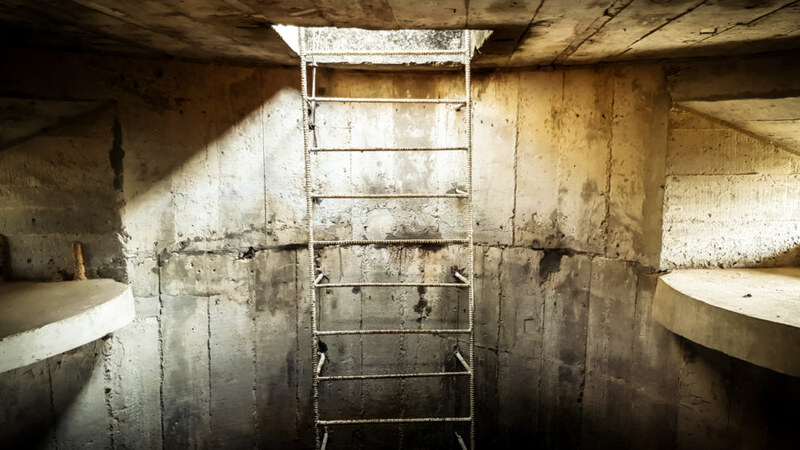 The bunker down below was dry and empty when I visited but some you encounter may be flooded or filled with noxious pests. 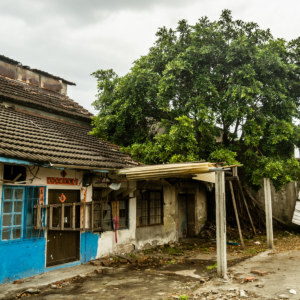 Ravenous mosquitos are really what you have to worry about—the huntsman spiders typically found in these ruins aren’t nearly as interested in your blood. Openings for machine guns to shoot oncoming infantry, I would assume. 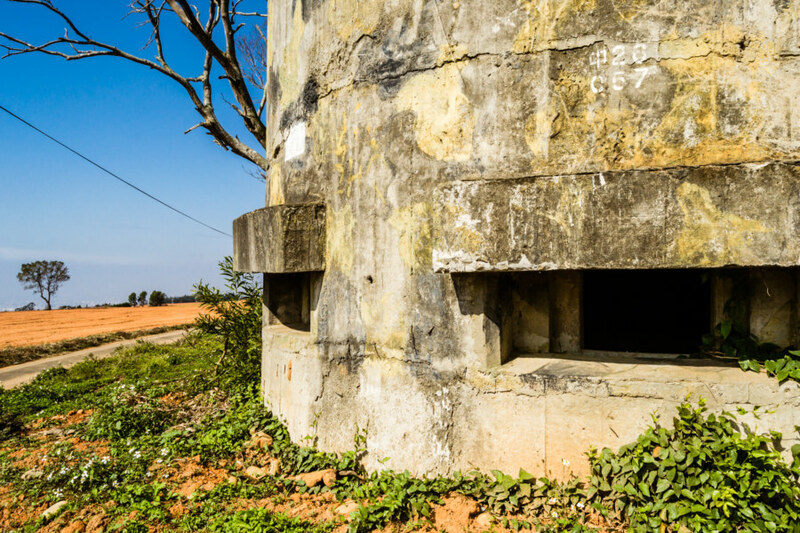 You may be wondering: what exactly is an “anti-airborne fort” anyway? At first I thought this phrase might be a bad translation1 but no, apparently these fortifications are designed specifically to repel aerial assault by paratroopers and the like, not the planes themselves. 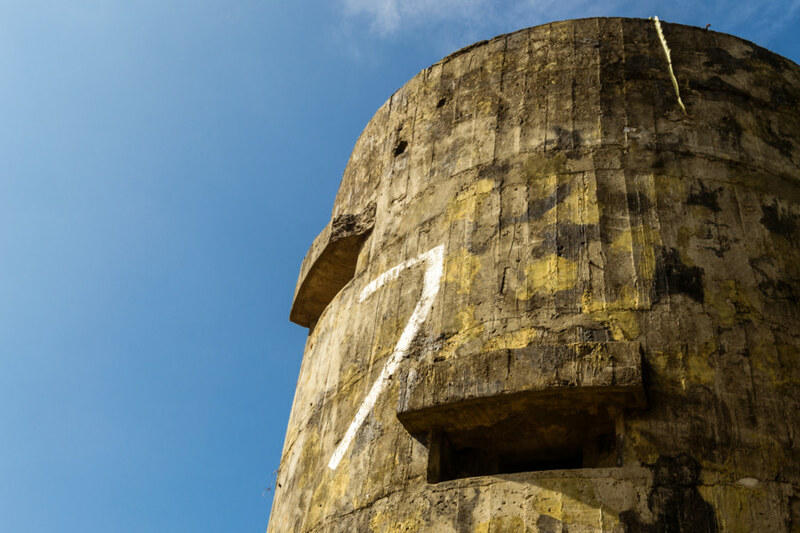 I’m no expert in military matters but I would hazard a guess that these structures were built out of reinforced concrete to house a few dozen machine gunners each. 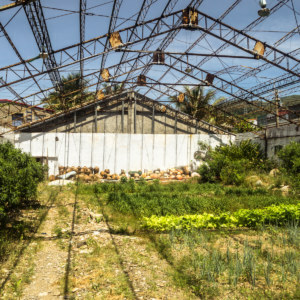 Inside there are three levels (not including the open rooftop) plus a bunker down below with two separate entrances hidden in the foliage beyond. 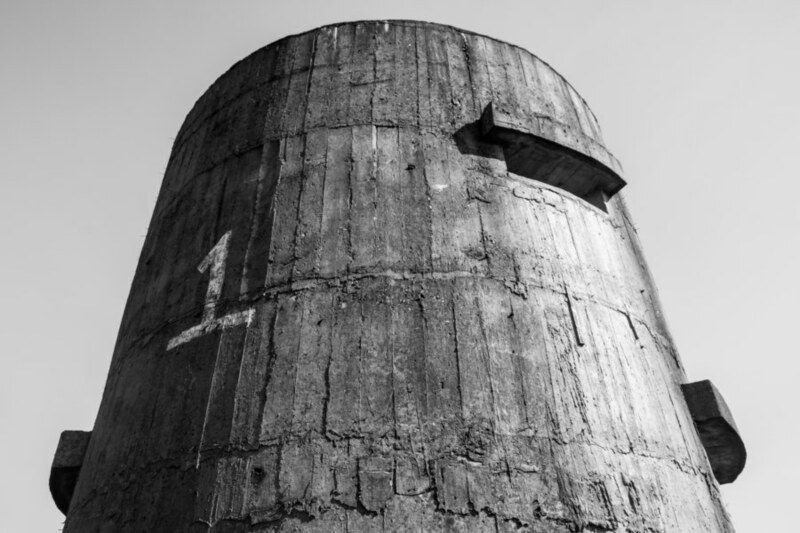 The fortifications in the style of the #7 are all post-war structures constructed by the KMT to defend against invasion by communist China. I don’t have exact information about when they were built and later abandoned but it’s not unreasonable to guess they date back to the 1950s. 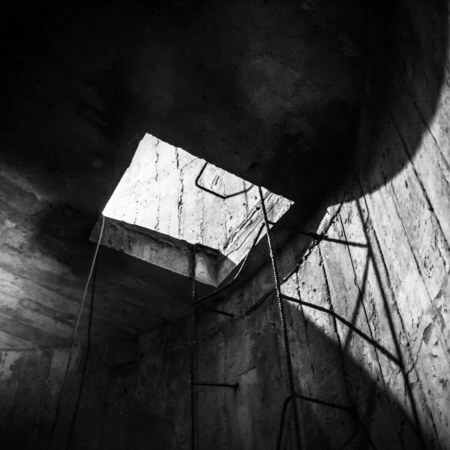 A peek inside the abandoned gun tower. This door is still locked. 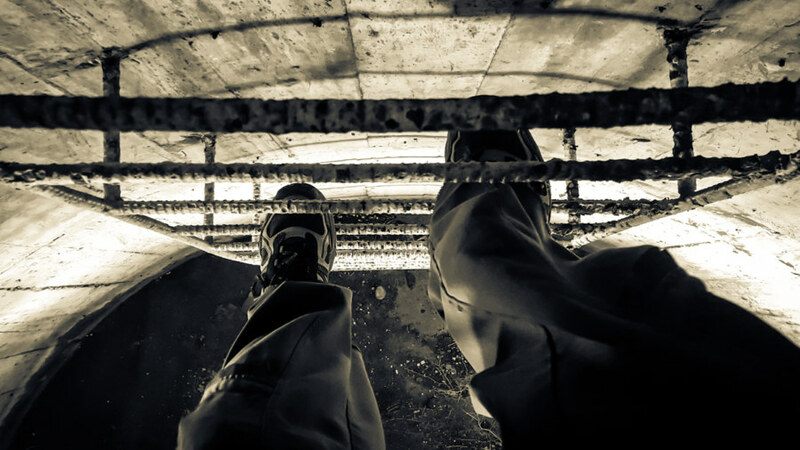 A precarious climb on rusty rungs. I wish I had brought gloves. 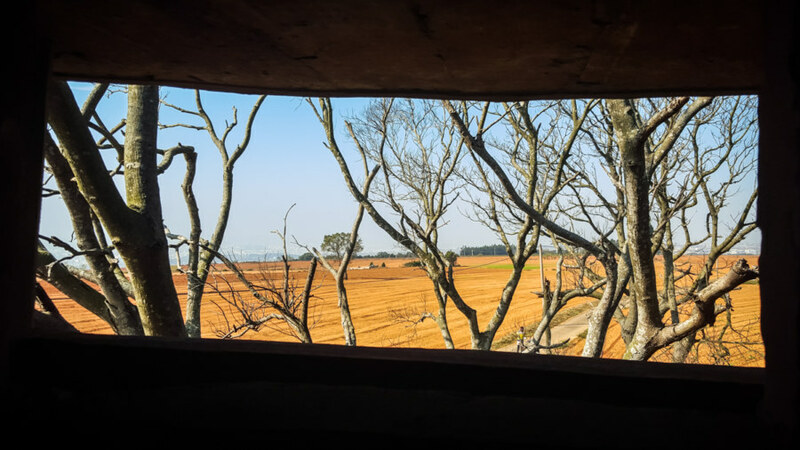 The view of the surrounding countryside from within the abandoned gun tower. The way to the rooftop. The landscape surrounding the #7 Anti-Airborne Fort is absolutely surreal. 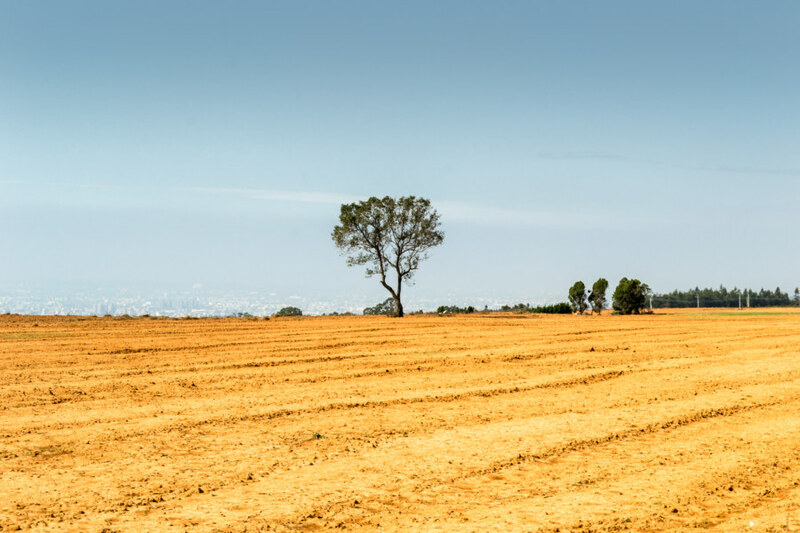 Rusty red laterite soils rich in iron and aluminum cover the plateau, limiting agricultural productivity. 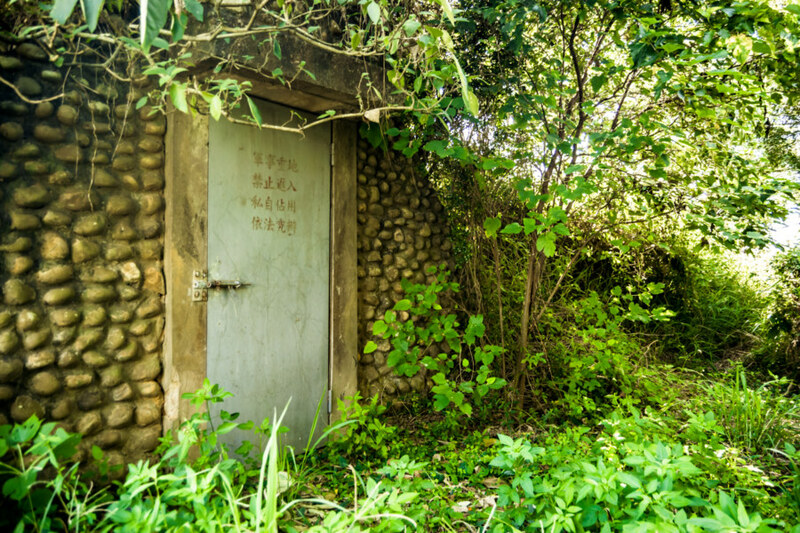 This type of soil is relatively common in Taiwan—you’ll also find it on the Linkou Plateau, for instance—and was traditionally used for manufacturing bricks2. 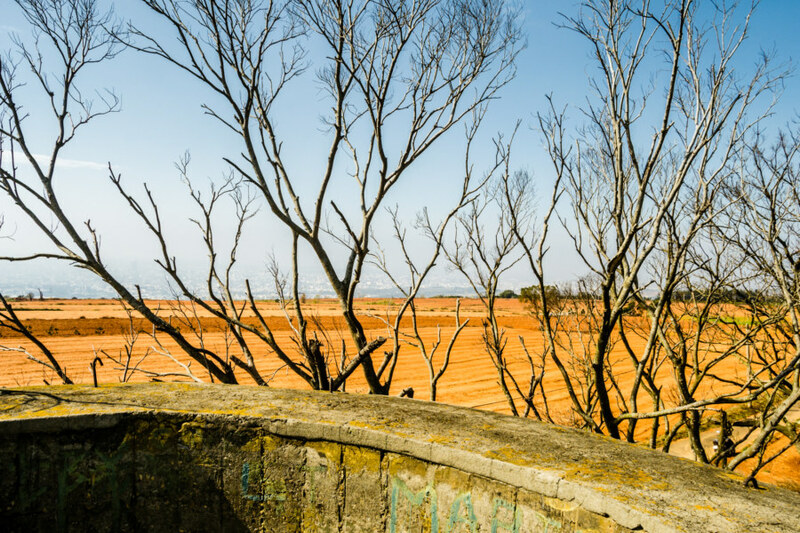 A surreal landscape seen from the top of an abandoned gun tower. The ochre soils of the Dadu Plateau. 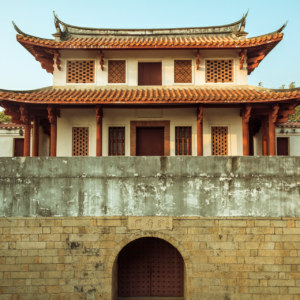 Not all of the fortifications of the Dadu Plateau are as accessible as #7. 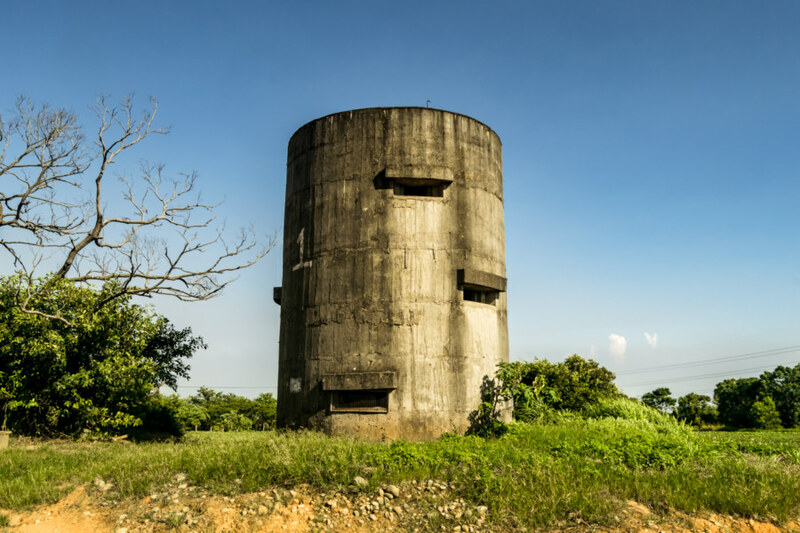 Apart from several gun towers on the grounds of Taichung Airport to the north (not featured here) the #6 Anti-Airborne Fort is located behind the walls of an active military base. Although it is faintly visible from the roadside I won’t share photos here for obvious reasons. The remaining numbered fortifications are all approachable but gaining entry might be difficult or impossible. South of #6 we cross over into the far northwestern extent of Xītún 西屯. 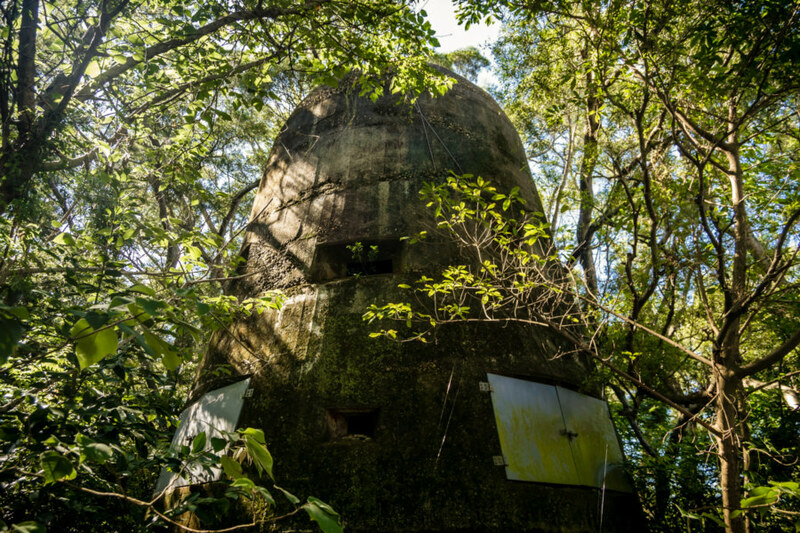 A conical Japanese colonial era gun tower lost in the overgrowth just outside Taichung Metropolitan Park. 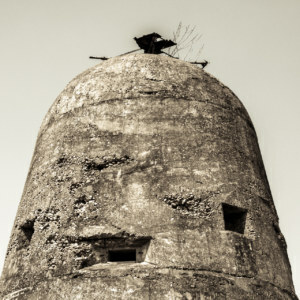 Next on the list is a Japanese colonial era gun tower from World War II, one of only two remaining on the Dadu Plateau3. 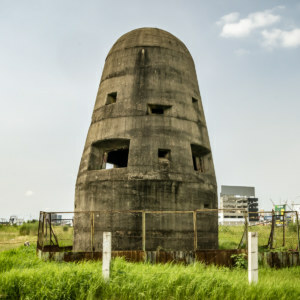 Much like the lone gun tower at the Taichung Aerodrome this one was designated a historic site in 2006 but nothing has been done to make it accessible to the public4. 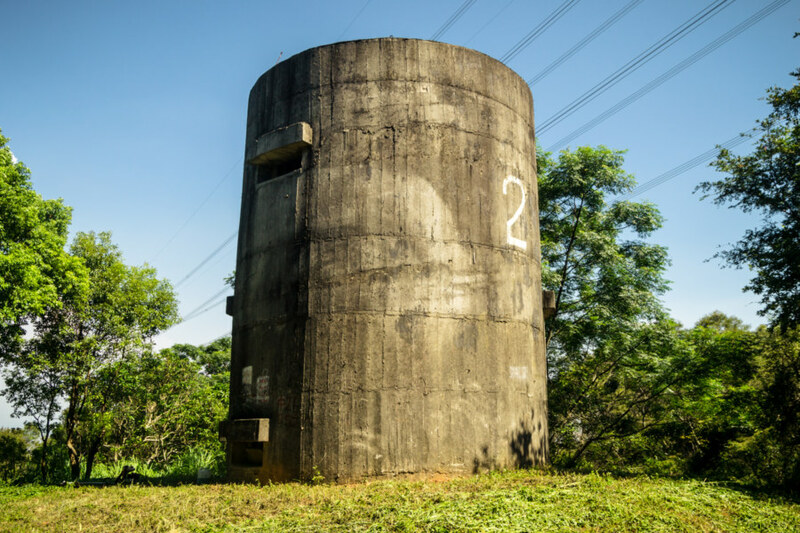 Officially known as the Japanese Army 3102 Highland Gun Tower 原日軍3102高地機槍堡 (so named for its position in some kind of military code), it was previously known as the World War II #5 Bunker 二次大戰五號碉堡. 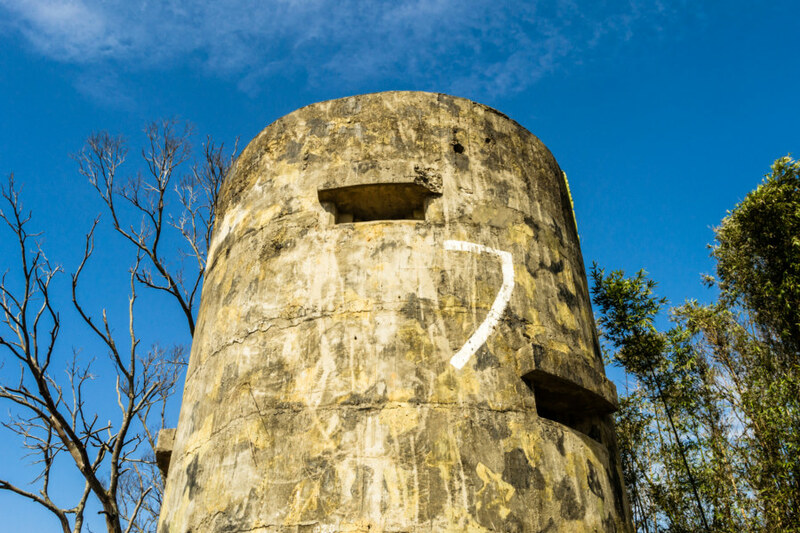 The number “5” would have been assigned to the gun tower when the ROC army fortified the plateau after the war and I speculate they continued to station troops here into at least the late 1970s. 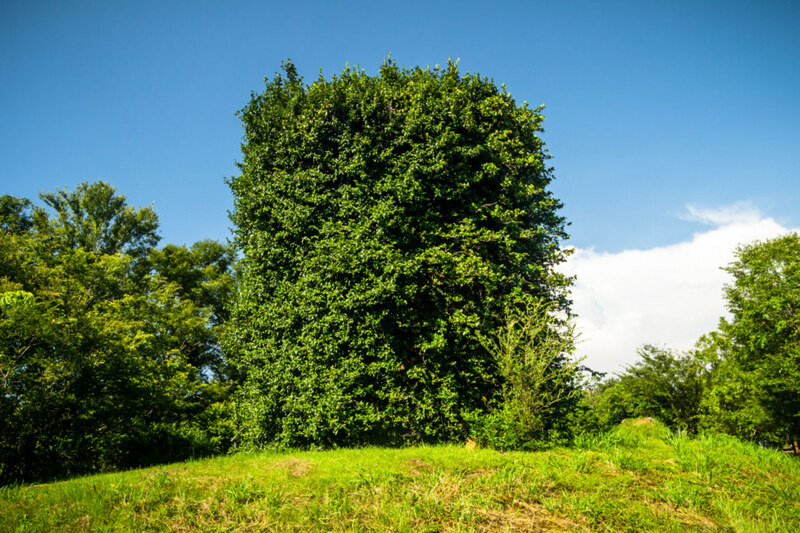 Finding this particular tower is a bit tricky as it is heavily overgrown—but if you scan the roadside just north of the park you should be able to pick it out. 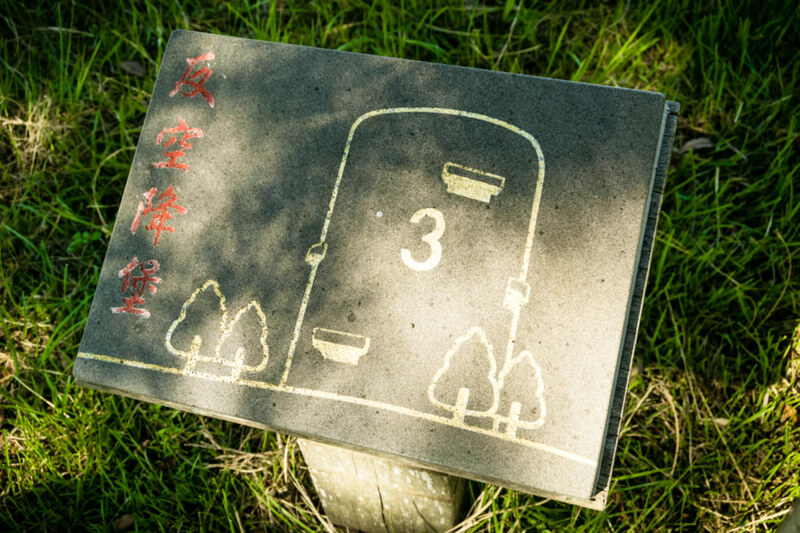 The #4 anti-airborne fort is neatly landscaped and integrated into Taichung Metropolitan Park. All entrances are sealed, of course. I find this plaque unreasonably adorable for some reason. At least this saves me the trouble of trying to figure out what number this one is! 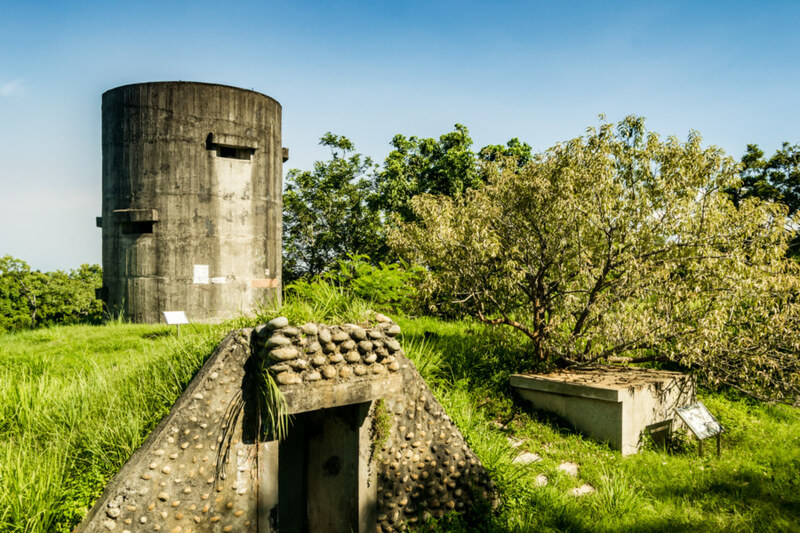 The completely overgrown #3 Anti-Airborne Fort in Taichung Metropolitan Park. 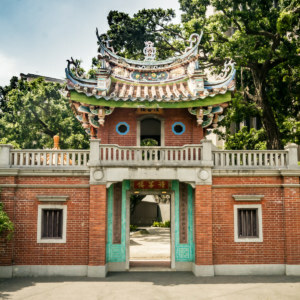 Head a little further south and you’ll arrive at the expansive Taichung Metropolitan Park 臺中都會公園, a popular weekend getaway for residents of the sprawling city. Two anti-airborne fortifications can be found here, both of them completely sealed from the outside, but still interesting to see. I particularly like the #3 Anti-Airborne Fort; it’s totally overgrown! Puzzling out where these are shouldn’t be tough; there’s one apiece on each side of the park. The second anti-airborne fortification is looking very handsome in this clearing a short distance from the main road. 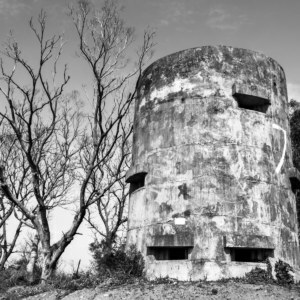 The second anti-airborne fort is somewhat harder to locate given that it is isn’t visible from the roadside, nor is it in the park, though that may change. After bushwhacking through the wilderness I was surprised to find a team of workers cutting the grass and cleaning out the interior of the fort (then again, I suppose they were just as surprised to see me there). I wasn’t able to understand exactly what was going on but I left with the impression that the city is tidying up this fort to prepare it for something, the obvious thing being an expansion of the park. 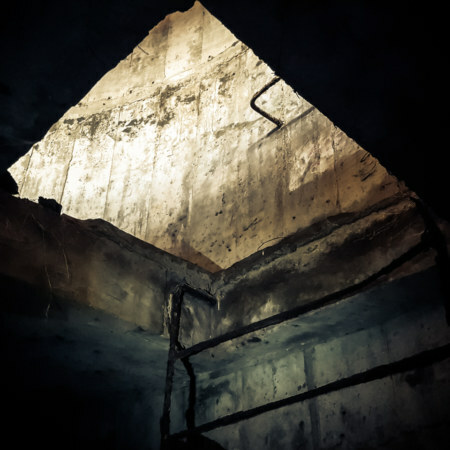 I briefly entered the bunker beneath the tower to poke around after receiving permission from the foreman and left with smiles all around. I’m not sure if it is usually so easy to take a look around the #2 but the workers didn’t mind me taking a peek. No entry for unauthorized personnel. 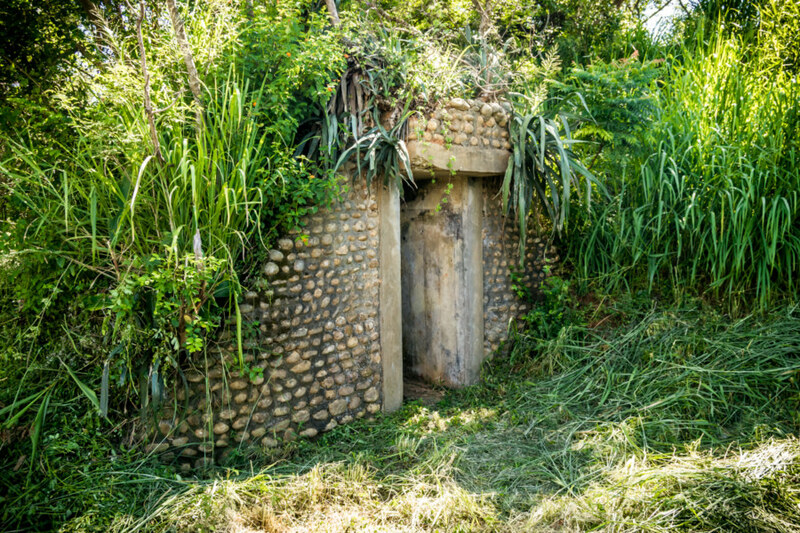 Overgrown entrance to the #1 Anti-Airborne Fort. 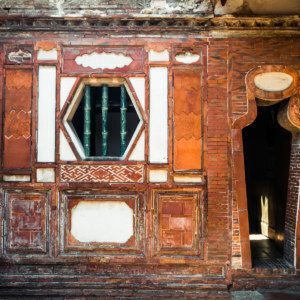 It seemed as if there was a small wall built around the entrances at one point. Maybe the soldiers stationed here got bored on all those countless long nights. Coming around the hummock that obscures the entrance to the bunker beneath the #1 Anti-Airborne Fort. Here you can see the ochre soils of the plateau again. Evening descends over the fortifications of the Dadu Plateau. 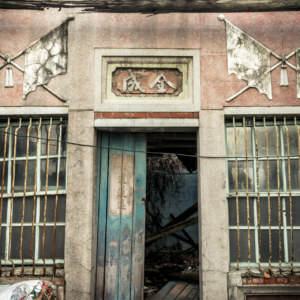 The countdown ends with the very last fortification I will cover in this post, the #1 Anti-Airborne Fort 一號反空降堡. Much like the #7 this one faces out toward the sea and is surrounded by ruddy ochre soil. Access to the interior seems possible but it was getting late into the afternoon and I didn’t bother after seeing various multi-legged critters scurry off into the darkness after I cracked the door open. No cleaners were in evidence here and given that it is surrounded by farmers’ fields (sweet potato, at a glance) I would imagine this one will remain pretty much as it is today for the interminable future. 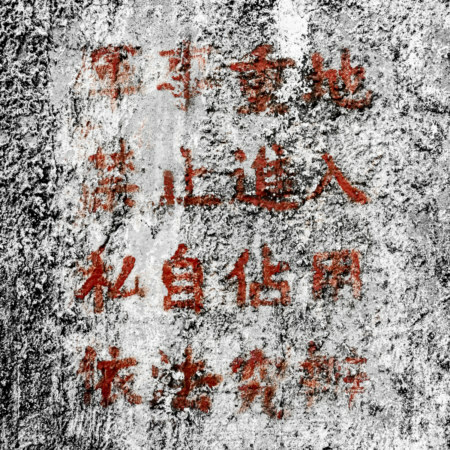 Last on the list: Dadu Plateau Anti-Airborne Fort #1 大肚台地一號反空降堡. Paul took eight-year-old Philip and three of his classmates on a picnic to a hillside field near the university to watch the migrating birds. 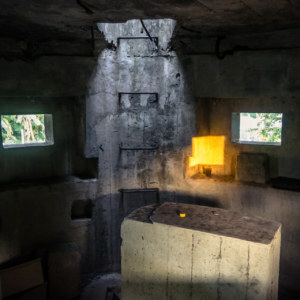 They decided to eat their picnic inside the old pillbox, an abandoned gun emplacement that had been built on the island by the Japanese during World War II. Philip ran ahead to climb up the large pile of rocks to enter the concrete structure, which the family had visited recently. The classmate who followed Philip into the pillbox called out, “Where is Philip?” Paul quickly entered to look. 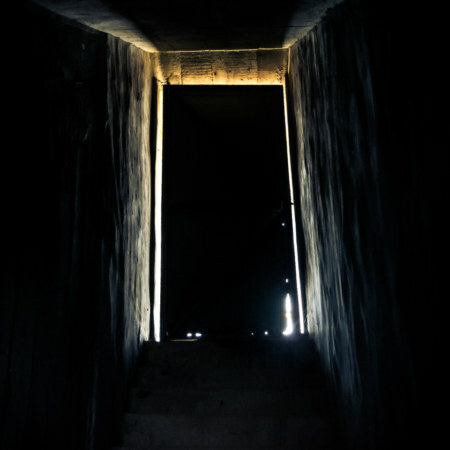 There was a ladder that allowed access to the deep tunnel that led to the other entrance some distance away. 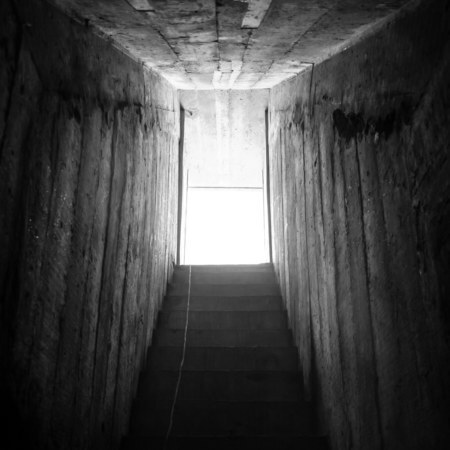 To Paul’s horror he saw that the third rung of the ladder was broken. Apparently Philip had started down the ladder to hide from his friends, when he slipped and fell some 50 feet. He never regained consciousness and died four hours later. There’s only a few Japanese fortifications left on Dadushan and I think I’ve been to all of them… so I suppose I must have visited the scene of the accident at some point. 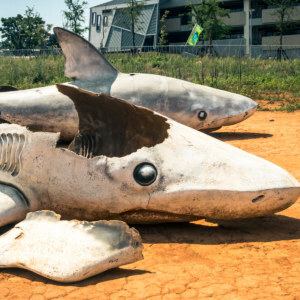 What a tragedy.